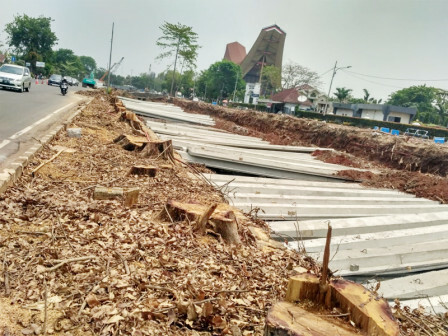 The sheetpile installation on the BGR riverbank Jalan Bukit Gading Raya, Kelapa Gading Barat Urban Village, Kelapa Gading, North Jakarta is one of North Jakarta Water Resources' efforts to overcome the inundation on Jalan Boulevard Barat Kelapa Gading.
" Jalan Bukit Gading Raya is prone to inundation when it rains, so we try to make the river into a long storage to hold water"
Jakarta Water Resources Sub-dept. 's East Stream Section Head, Nelson Simanjuntak stated that sheetpile is installed up to 1,900 meters long with 12- 15 centimeters wide. It has been conducted since July and is targeted to be finished by the end of this year. "Jalan Bukit Gading Raya is prone to inundation when it rains, so we try to make the river into a long storage to hold water," he expressed, Friday (11/16). The work has touched more than 45 percent. If it is finished, the water will be flowed to the Sunter River before being dumped into the sea. "This work is still our focus now, so for this year we have yet to do dredging to deepen the river," he stressed.